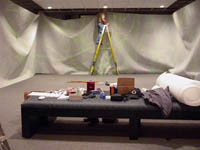 All available hands are brought in to make the transformation happen in little over a day. 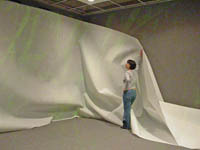 The Fiberscapes installation would require some creative solutions that include using materials such as "wire" commonly used in the the paper industry to form large sheets. In addition, vinyl flooring materials painted white provide the reflective surface needed for the immersive environment. 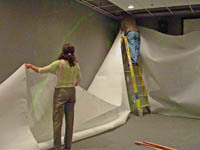 Hanging the wire from the walls requires help from many PDC staff, including PDC curator Carrie Feld Mahlik. 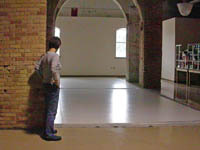 Jennifer inspects Bob and Roger's vinyl floor solution at the River Level floor of the Paper Discovery Center before it is moved up to the theater. Hey, the River Level looks like a perfect studio to us. 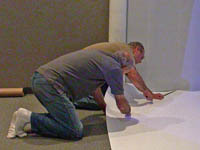 Bob and Roger make the final cuts in the flooring material to fit to the projected images that fill the walls and floor of the room. 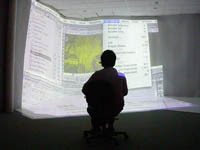 Time out to consult with a software technician about an unexpected glitch with a program. 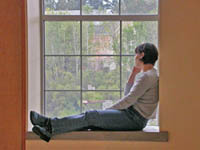 It helps that the PDC overlooks the Fox river. It even has its own Bald Eagle. Jennifer works on some final adjustments to the video installation. The space is about ready for the show to begin.